A growing number of companies collect information using devices connected to the Internet. To realize the enormous potential value of this data, businesses need effective tools. The SAS Viya edge-to-enterprise Internet of Things (IoT) analytics platform lets businesses gather and process data streams at the edge, then transfer them to the datacenter for further processing. A suite of supporting software applications helps them analyze and mine IoT data and develop analytical models that assist with real-time decision making. Principled Technologies implemented the SAS Viya edge-to-enterprise IoT analytics platform and created a reference architecture that shows how businesses can use SAS Viya to distribute analytics between the edge and the datacenter. The RA highlights the hardware and software PT used in their implementation. 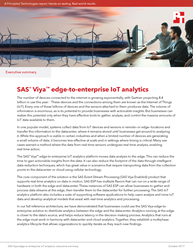 To learn more about the SAS Viya edge-to-enterprise IoT analytics platform and how companies can implement it, read the full reference architecture at facts.pt/Lmdxjs or glance through the executive summary at facts.pt/h3Azjx.